Transition state for reaction between ethene and dichlorocarbene. Click for 4D. The reaction is a 4-electron pericyclic process, and so is subject to the Woodward-Hoffmann rules, which imply that such a 4n-thermal process should go with one antarafacial component. 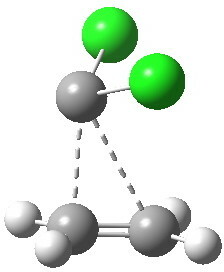 But there is a (rarely cited or observed) alternative, as was illustrated for the π2+π2 cycloaddition of ethene to itself. There we saw the gymnastics of a limbo dancer, with one ethene sliding up to the other rather than taking a full-frontal approach. But whilst that reaction had an unrealistic activation barrier of ~50 kcal/mol, the reaction between dichlorocarbene and an alkene is known to be a very facile one. And so the calculation shows (below). The barrier to reaction is small, and so this is an example of a low-barrier nominally forbidden reaction which nevertheless achieves a low barrier by avoiding the direct approach of the two molecules and adopting a round-about path! This round-about approach is seen best in the IRC for the addition to dicyano-ethene. Shown above is the gradient norm along the IRC. From IRC -1.2 to 0.0 (the transition state) the reaction corresponds to the formation of effectively just one C-C bond (a two electron process if you like). At IRC +2.0 a second distinct feature is seen in the graph, and this now corresponds to the formation of the second C-C bond, involving a sliding motion of the carbene (again, a two-electron process). So by breaking a four-electron process into two phases, each involving just one electron pair, a lot of the forbidden Woodward-Hoffmann character seems to be avoided. Truly the direct approach not being the best! This entry was posted on Tuesday, June 12th, 2012 at 10:19 pm and is filed under Uncategorized. You can follow any responses to this entry through the RSS 2.0 feed. You can leave a response, or trackback from your own site.